Mohamed Fasil from Kochi, BCA Graduate. Mohamed Fasil is Software Engineer and currently have no work experience. 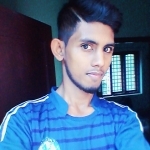 PHP .NET VISUAL 3D C++ JAVA SQL C HTML .. MICROSOFT OFFICE ADOBE - PHOTOSHOP DATA ENTRY COMPUTER.. CASE STUDY REPORTING..
are one of expert skill area's of Mohamed Fasil . Mohamed Fasil is working in IT Software industry. JAVA SQL C HTML ..